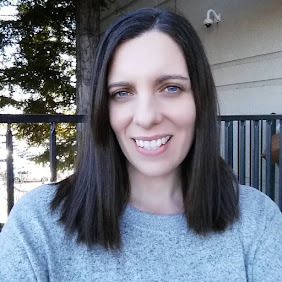 I am a big believer in "buying local" and supporting small businesses whenever possible. So I was pleased to come across a company called Seattle Sundries that operates out of the very charming Ballard neighborhood. 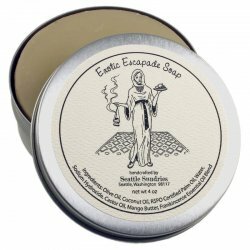 Seattle Sundries makes and sells handcrafted, all natural soaps and other personal care items. All artisan soaps are made in small batches and cut by hand with great attention to quality and detail. Every product is made using only natural oils, butters, botanicals and 100 % essential oils. I have used both Exotic Escapade and Cowpoke Soaps and really enjoyed the lovely scents they gave off. 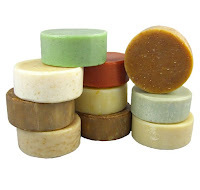 The soap gently cleans well but without any harshness or chemicals. They also have something called Solid Lotions that are little round bars of lotion that nourish and sooth your skin. 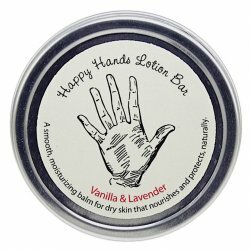 I used the Vanilla and Lavender scented lotion bar and it was out of this world. I absolutely love this combination of fragrance. Seattle Sundries offers twenty four different kinds of soap, all with charming names for each one. Who wouldn't want to try a soap called Naughty Nellie, Lavender Lover, or Gardeners' Gold? All of these items come attractively packaged in old-fashioned, sweet wrappings and tins. There are gift sets for all occasions, and private label and custom made soaps are also available. 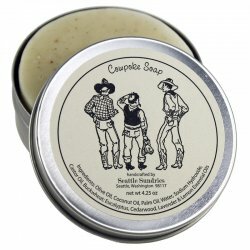 Visit their website at seattlesundries.com to see all of the products and for more information. Made with shea butter, wheat germ oil and sweet almond oil. 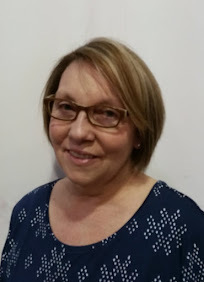 You can learn more about Seattle Sundries and the owner Anne on her Facebook and Twitter pages.